Type Compact | TROX Malaysia Sdn Bhd. With heavy dust levels in the room, suitable extract air filters must be provided. 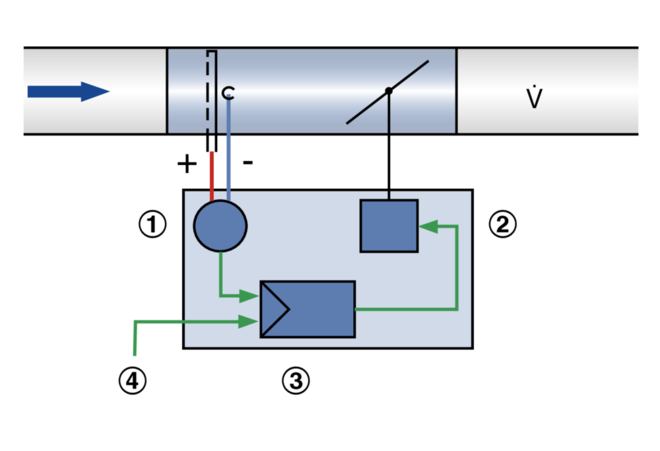 The volume flow rate is determined by measuring the differential pressure (effective pressure). For this purpose the VAV terminal unit is fitted with a differential pressure sensor. The integral differental pressure transducer transforms the effective pressure into a voltage signal. The volume flow rate actual value is hence available as a voltage signal. The factory setting is such that 10 V DC always corresponds to the nominal volume flow rate (Vnom). The volume flow rate setpoint value comes from a higher-level controller (e.g. room temperature controller, air quality controller, central BMS) or from switch contacts. Variable volume flow control results in a value between Vmin and Vmax. It is possible to override the room temperature control, e.g. by a complete shut-off of the duct. The controller compares the volume flow rate setpoint value to the actual value and controls the integral actuator accordingly. Volume flow rate parameters and voltage ranges are factory stored in the controller. Changes on the customer's site can easily be carried out using an adjustment device, a notebook with service tool, or a bus interface.